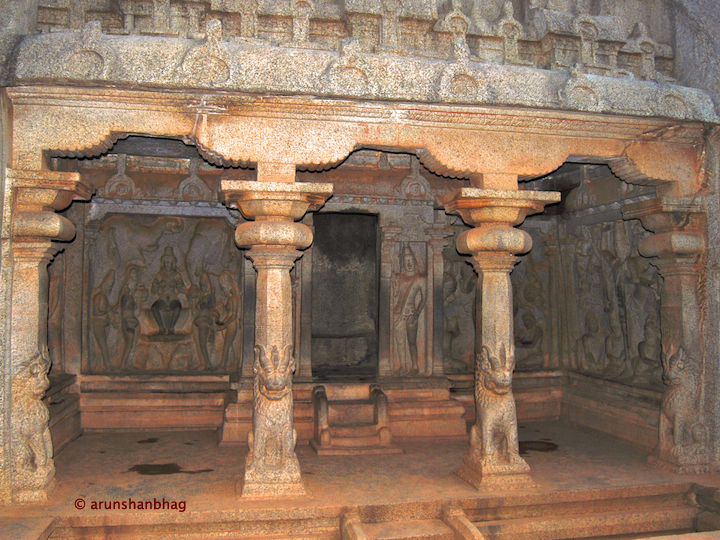 Mandapas or Cave shrines of Mamallapuram. The Pallavas (4th – 9th century ce) were the first dynasty to rule over large tracts of present day Tamil Nadu. Their capital at Kanchipuram was at the cross-roads of the North-South trade in spices, gems and silks. Their thriving port at Mamallapuram was the export nexus for trade with the distant lands of Java, Sumatra and Cambodia. The prosperity of the Pallavas, permitted their artistically minded King, Mahendra Varman (571-630 ce) to be a patron of the arts, focusing on sculpture and replicating in stone, temples which were previously built in wood, brick and mortar. Their dynastic reign thus oversaw the initiation and development of temple architecture in South India. Their work influenced temples as far away as Ellora and across the bay in Cambodia. Despite their relatively short reign, the Pallava temples inspired even invading rulers. Their armies competed not only on battlefields, but also in designing sacred spaces for the divine. Muslim invasions and their assured destruction of Hindu art, fortunately did not penetrate this area. Thus uninterrupted, temple architecture evolved in Tamil Nadu for nearly two millennia. In the port city of Mamallapuram (then Mahabalipuram) in 590 ce, Mahendra Varman initiated the concept of mandapas, or pavilions, wherein prayer halls were scooped out of the side of mountains with sculpted images in bas relief and supported with simple columns. Mahendra Varman was certainly inspired by similar mandapas in nearby Andhra lands and possibly also the Chalukyan cave temples in Badami. See my posts on Cave Temples of Badami. I share with you the Varaha mandap, honoring Varaha, the boar avataar of Vishnu. This mandap (or gudi) is smaller and sparsely decorated, compared to the spacious and exquisite detailing of the Badami Caves. The gudi is about 8 ft deep, two facing carvings, two on the side walls and a couple of pillars. The sanctum is simply hewn. The first panel on the left pays tribute to Varaha. Earth has just been born and evolution set in motion. But a giant serpent sweeps the young earth to the depths of the cosmic abyss. Evolution and the future of humankind are threatened and the Supreme Divine intervenes. Vishnu takes the form of the boar (Varaha) and plunges to the watery depths, subdues the serpent, rescues earth (represented as the young goddess Prithvi) and carries her to the surface. In this relief, Varaha’s right foot is firmly planted on the hood of the snake, while celestials adore the hero. This panel on the right wall honors the Trivikrama (aka Vamana) avataar of Vishnu. With his two feet he occupies all earth and the skies, and with his third step, suppresses the egotistical King Mahabali. Mamallapuram was previously called Mahabalipuram after this king. The panel facing the entry honors Devi. This one puzzled me. Notice the dress, facial and anatomic features of the two kneeling in front. They have a markedly oriental ‘look’ (for lack of a better word). What do we make of it? Records from early in the millennia indicate that traders from China arrived on this coast for gems and silks. Further, we know Hindus traders also spread their faith to the distant lands of Cambodia and Java. Is this panel supposed to highlight an interaction? Interestingly, the person on the bottom left appears to be slicing his head off in devotion to the Devi. Or is he just slicing off his hair tuft, a common depiction of a buddhist converting to Hindu dharma. Notice the kneeling male on the right; has he brought an infant for Devi’s grace? Not clear and not a peep from art historians. And this naturally occurring balancing rock, aptly called Krishna’s “butter ball.” For scale, notice the person sitting on extreme left. Revel. Speaking Stones: World Cultural Heritage Sites in India, Eicher Goodearth (2001). M Hirsh, “Mahendravarman I Pallava: Artist and Patron of Maamallapuram,” Artibus Asiae (1987). H Zimmer, Myths and Symbols in Indian Art and Civilization, Princeton University Press (1946, 1992).